Please click on the attached https://flags4heroesbeaver.com to sponsor a flag. Flags will be displayed* at Quay Park, directly next to the Beaver County Courthouse, behind the Vietnam War Memorial. The flags will be raised on Saturday, May 26th, and will remain for the week after Memorial Day. Each flag pole will have a medallion attached to it. On the reverse side of the medallion will be the hero’s name and the sponsor’s name. 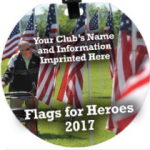 Honor your hero by sponsoring a flag with a $50 tax deductible donation. Heroes may include someone important in your life, whether they be military personnel, first responders, health care workers, grandparent, spouse, child, teacher, etc.). A hero can be someone who is admired or idealized by you or someone close to you. If you are unsure of whom to honor, a local recipient can be chosen on your behalf to receive the honor and accompanying certificate. *Flags are not purchased by the flag sponsor. Flags are owned by the Rotary Club of Beaver, PA and are flown in honor of the sponsor’s hero.